The 14th edition of the World Bank Group (WBG) Air Transport Annual Report, which outlines the support that is given to emerging and developing countries in air transportation has made its debut. In FY2018, the WBG’s Air Transport Portfolio amounted to US$979 million, a decrease of 3.88 percent from Fiscal Year 2017 (FY2017), which was due to the completion and closing of larger airport infrastructure projects. The Air Transport segment makes up around 2.03 percent of the WBG’s US$48.2 billion Transport portfolio. The WBG’s FY2018 Transport portfolio consists of approximately 16.13 percent of the WBG’s active portfolio of US$299.1 billion (excluding MIGA). The decrease of the infrastructure financing portfolio in air transport is in line with the so called “Cascade Approach,” in which the WBG helps countries maximize their development resources by drawing on private financing and sustainable private sector solutions to provide value for money and meet the highest environmental, social, and fiscal responsibility standards, and reserve scarce public financing for those areas where private sector engagement is not optimal or available. The Air Transport portfolio includes 44 lending and non-lending projects or project components through the International Bank for Reconstruction and Development (IBRD) and International Development Association (IDA), as well as the International Finance Corporation (IFC)’s Investment portfolio. In addition, IFC is supporting 26 Advisory Mandates and MIGA is providing three Guarantees for the Air Transport Sector. Project highlights in FY 2018 include the completion of the Multi-Modal Transport Project in DRC by supplying and installing air navigation and control system at Kinshasa, five ADS-B ground stations in Kinshasa, Lubumbashi, Kisangani, Mbandaka, Ilebo and training of 25 Air Traffic Control personnel. Another highlight was the US$50 million IBRD commitment for the Shangrao Sanqingshan Airport Project, which was completed as a as “Green Airport” in FY2018. 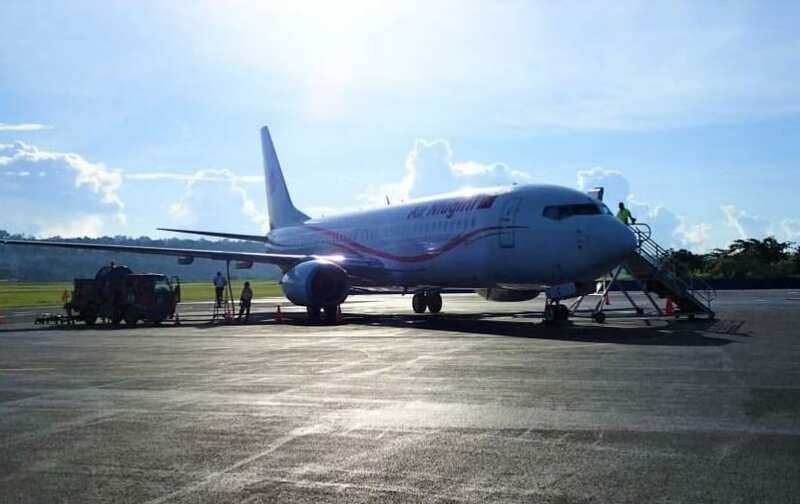 The Vanuatu Aviation Investment Project of US$19.5 million progressed in FY 2018 by the commencement of physical works for Bauerfield International Airport for runway rehabilitation and apron pavement improvements. Furthermore, the Pacific Aviation Safety Office Reform Project, which included of an US$2.15 million IDA Grant in FY 2014, and additional financing of US$0.95 million in FY 2017, benefitted of additional US$13.55 million in FY 2018. Finally, an air transport team carried out an assessment of the Sint Maarten Airport Terminal Reconstruction. This came as a request for reimbursable technical assistance for the implementation of a Dutch Trust Fund for the reconstruction and rehabilitation of various infrastructure and essential services in Sint Maarten following the devastating hurricanes in September 2017. Major active commitments by the International Finance Corporation (IFC) include Queen Alia II in Jordan, the Zagreb Airport in Croatia, the Enfidha Airport construction in Tunisia, airports in Nosy Be and Antananarivo in Madagascar. In addition, the IFC investment portfolio also includes Lima Airport (Peru), Montego Bay Airport (Jamaica) and the Greek Regional Airports (14 in total). IFC is active through the provision of Advisory Services for Kingston Airport (Jamaica), the Saudi Airports (26 in total), Sofia Airport (Bulgaria), Podgorica and Tivat (Montenegro), Beirut Airport (Lebanon) and Clark Airport (Philippines). MIGA has been involved in the air transport sector in the past through the issuance of guarantees for three airport projects in Ecuador, Peru and Madagascar.